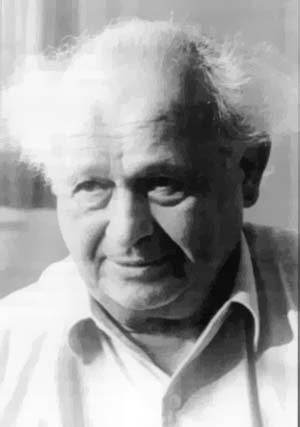 Moshe Feldenkrais (1904-1984) is the founder of what is today called the Feldenkrais Method. As a result of suffering debilitating injuries Feldenkrais began an intense exploration into the relationship between bodily movement and healing, feeling, thinking, and learning. In the process of healing himself, Feldenkrais made revolutionary discoveries, culminating in the development of the method that now bears his name. There are two aspects to his method: an individual manipulatory technique of neuromotor education called Functional Integration and a group technique called Awareness Through Movement. His unique and subtle approach to facilitating human change and to improving functioning is spelled out in a number of influential books, including: Awareness Through Movement, Body and Mature Behavior, and The Elusive Obvious. Dr. Feldenkrais was also the author of a number of books about Judo and one of the first Europeans to hold a black belt in the art. Today there are nearly four thousand Feldenkrais Method Practitioners around the globe. His insights contributed to the development of the new field of somatic education and continue to influence disciplines such as the arts, education, psychology, child development, physical and occupational therapy, sports enhancement, and gerontology. Finally in paperback after many years, this classic guide on how to maintain a healthy, active body and mind has helped many people find renewed health and sensory awareness through the Feldenkrais work, which is suitable for all ages. A victim of debilitating injuries, Moshe Feldenkrais was intimately aware of the link between bodily suffering and mental health. Through healing himself, he made revolutionary discoveries, culminating in the development of the method that now bears his name. Body Awareness as Healing Therapy: The Case of Nora is Moshe Feldenkrais' classic study of his work with Nora, a woman who has suffered a severe stroke and lost her neuromuscular coordination, including the ability to read and write. Feldenkrais uses rational and intuitive approaches to help his student relearn basic motor skills. Hadaka-Jime: Practical Unarmed Combat is a unique training program that is based on one core judo technique. Dr. Feldenkrais developed the program for soldiers in World War II. Through ten one-hour lessons, soldiers learned to defend themselves against an armed opponent in the most rapid and effective way possible.